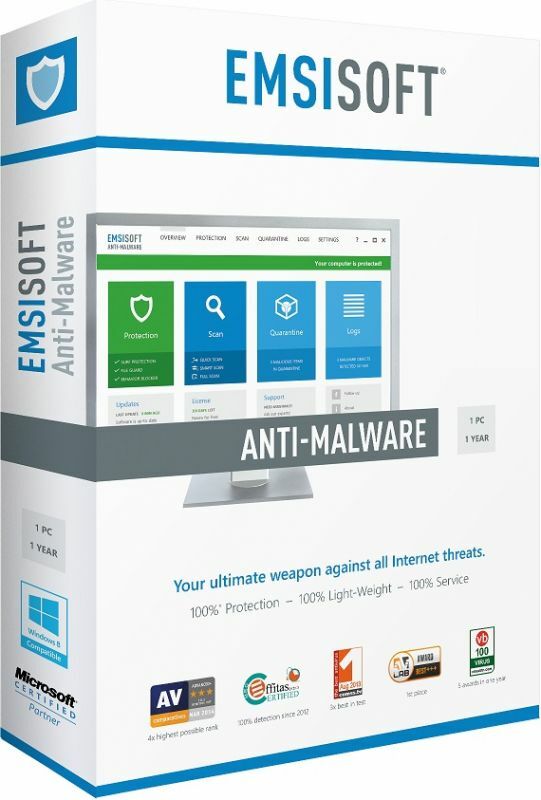 Emsisoft Anti-Malware is one of the most powerful software to protect your computer against viruses, Trojan horses, spyware or adware. This Anti-Malware is extremely quick and it consume almost no resources. 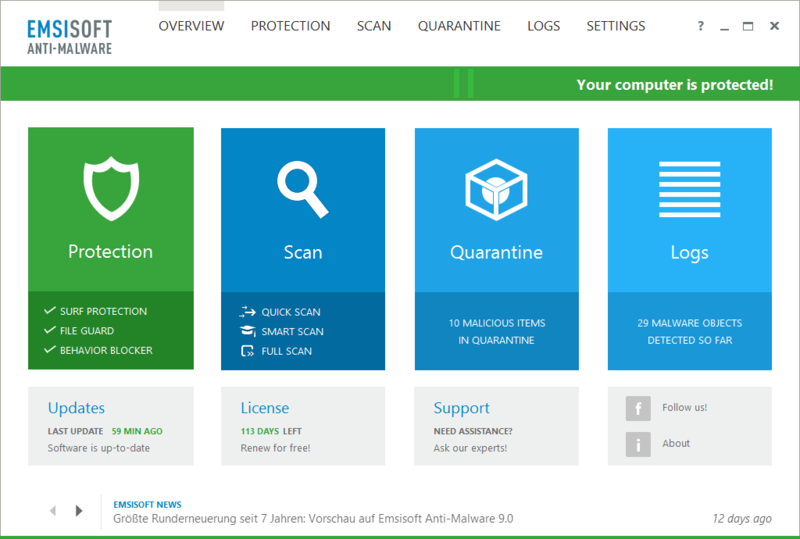 In fact, this Anti-Malware will protect your computer when you surf over the internet, all applications are scanned by Emsisoft Anti-Malware in real time and it will inform you if the software are trustable or maybe infected, it has 2 powerful scanners to find the malwares very easily. This is one of the best Anti-Malware on the market. Emsisoft Anti-Malware relies on a very user-friendly interface, with nifty tabs that hide automatically every time you open a new window within the program and can be confugure without any problems. The ‘Protection‘ tab provides a quick overview over the application, letting you know if ‘Surf Protection‘, ‘File Guard‘ and ‘Behavior Blocker‘ are turned on or not. While the ‘Scan‘, ‘Quarantine‘ and ‘Logs‘ tabs come with pretty self-explanatory names, the ‘Configuration’ menu opens a whole new world to the user. There are tons of options regarding every single feature of the app, including the scheduled scans and notifications. Emsisoft Anti-Malware normally costs around $40/serial number. Digiarty Software (WinXDVD) is providing a giveaway of Emsisoft Anti-Malware 9 from where you can get a 1 year full version license for free but for that you must need Facebook account. If you are interested, you just need to visit giveaway landing page, scroll down the page till you will get “How to Get the Full Code of Emsisoft Anti-Malware” section and now you just need to follow on-page instructions to win full serial key. It does not say how many licenses are left now for this giveaway. I am not sure that how long the giveaway is going to be so it means you have to grab the offer before it ends. How to Keep Your Web Content Fresh? Nice share but missed it.